Abraxane plus gemcitabine achieved a median overall survival of 12.2 months in patients with advanced pancreatic cancer, study reports. Patients with high-SPARC biomarker achieved significantly higher overall survival. Celgene International Sàrl announced on October 6 that results from a clinical study of Abraxane (paclitaxel albumin-bound particles for injectable suspension) in combination with gemcitabine in 67 patients with previously untreated advanced pancreatic cancer were published in an online article by the Journal of Clinical Oncology. Abraxane, approved by FDA for breast cancer, could be a life-prolonging drug for patients with advanced pancreatic cancer. After the first phase of the study, the recommended Phase II dose was 125 mg/m2 of Abraxane followed by 1000 mg/m2 of gemcitabine on days 1, 8 and 15 of every 28-day cycle. In Phase II, almost half of the patients responded (overall response rate was 48% (21/44)) and two-thirds experienced disease control (disease control rate was 68% (30/44)). The median progression-free survival was 7.9 months (95% CI: 5.8, 11.0) and the median overall survival (OS) was 12.2 months (95% CI: 8.9, 17.9). The one-year survival rate for patients was 48%. Levels of secreted protein acidic and rich in crysteine (SPARC) were evaluated in 36 patients. These patients were classified as either high-SPARC (average z-score greater-than or equal to 0, n=19) or low-SPARC (average z-score <0, n=17). According to the study, a significant increase in OS was observed for patients in the high-SPARC group versus the low-SPARC group (median 17.8 vs. 8.1 months, p=0.0431). SPARC level remained a significant predictor of OS in a multivariate Cox regression model after adjusting for multiple clinical covariates including gender, race, age, treatment and baseline CA19-9 level (p=0.041). Of note, SPARC in the stroma correlated highly with OS (p=0.013), while SPARC in the tumor cells did not (p=0.15). This is particularly intriguing as SPARC expression in the stroma, but not in the tumor, has been associated with poor survival, suggesting that a unique mechanism of action of Abraxane may play a role in this reverse outcome. Secreted protein acidic, rich in cysteine (SPARC) is an acidic, secreted extracellular matrix glycoprotein that plays a vital role in bone mineralization, cell-matrix interactions, and collagen binding. SPARC also increases the production and activity of matrix metalloproteinases, a function important to invading cancer cells within bone. Additional functions of SPARC beneficial to tumor cells include angiogenesis, proliferation and migration. Overexpression of SPARC is reported in many human cancers such as breast, prostate and colon. The most common DLTs in the first phase of the study were sepsis and neutropenia. During the second phase, the most common grade 3 or higher Abraxane-related non-hematologic adverse events were fatigue (21%) and sensory neuropathy (15%). The most common grade 3 or higher treatment-related hematologic adverse events were neutropenia (67%), leukopenia (44%) and thrombocytopenia (23%). These data are being confirmed in an ongoing, international, randomized phase III trial of Abraxane + gemcitabine vs. gemcitabine for patients with metastatic pancreatic cancer. Additional information about the trial can be found at: http://www.clinicaltrial.gov/ct2/show/study/NCT00844649?term=abraxane&cond=pancreatic%2Bcancer&phase=2&rank=2&show_locs=Y#locn. These data are reported from an investigational study. Abraxane is not approved as a treatment for previously untreated advanced pancreatic cancer. Pancreatic cancer is a malignant neoplasm of the pancreas. In typical usage, the term pancreatic cancer refers specifically to the significantly most common type of cancer, adenocarcinoma (and some variants thereof), that arises within the exocrine component of the pancreas, although the term can also reasonably be used to encompass less common types of cancer that also originate within the pancreas, and is quite frequently inclusive of the other exocrine cancers. Pancreatic cancer is the fourth most common cause of cancer death both in the United States and internationally. Celgene International Sàrl, located in Boudry, in the Canton of Neuchâtel, Switzerland, is a wholly owned subsidiary and international headquarters of Celgene Corporation. Celgene Corporation, headquartered in Summit, New Jersey, is an integrated global pharmaceutical company engaged primarily in the discovery, development and commercialization of innovative therapies for the treatment of cancer and inflammatory diseases through gene and protein regulation. For more information, please visit the Company’s website at http://www.celgene.com. Abraxane is a solvent-free chemotherapy treatment option for metastatic breast cancer which was developed using Celgene’s proprietary nab® technology platform. This protein-bound chemotherapy agent combines paclitaxel with albumin, a naturally-occurring human protein. Abraxane is currently in various stages of investigation for the treatment of the following cancers: expanded applications for metastatic breast, non-small cell lung, malignant melanoma, pancreatic and gastric. In 1967 Monroe E. Wall and Mansukh C. Wani isolated a mitotic inhibitor from the bark of the Pacific yew tree, Taxus brevifolia and named it taxol. Later named paclitaxel, the natural product has antitumor activity and is the active agent in Abraxane. 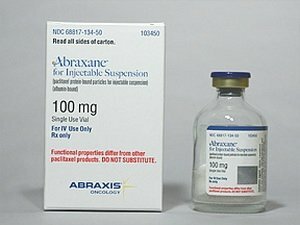 The U.S. Food and Drug Administration approved Abraxane for Injectable Suspension (paclitaxel protein-bound particles for injectable suspension) in January 2005 for the treatment of breast cancer after failure of combination chemotherapy for metastatic disease or relapse within six months of adjuvant chemotherapy. Prior therapy should have included an anthracycline unless clinically contraindicated. For the full prescribing information for Abraxane please visit http://www.abraxane.com. Abraxane® for Injectable Suspension (paclitaxel protein-bound particles for injectable suspension) is indicated for the treatment of breast cancer after failure of combination chemotherapy for metastatic disease or relapse within 6 months of adjuvant chemotherapy. Prior therapy should have included an anthracycline unless clinically contraindicated. Severe cardiovascular events possibly related to single-agent ABRAXANE occurred in approximately 3% of patients in the randomized trial. These events included chest pain, cardiac arrest, supraventricular tachycardia, edema, thrombosis, pulmonary thromboembolism, pulmonary emboli, and hypertension. Cases of cerebrovascular attacks (strokes) and transient ischemic attacks have been reported rarely. During postmarketing surveillance, rare reports of congestive heart failure and left ventricular dysfunction were observed, primarily among individuals with underlying cardiac history or prior exposure to cardiotoxic drugs. In the randomized metastatic breast cancer study, the most important adverse events included alopecia (90%), neutropenia (all cases 80%; severe 9%), sensory neuropathy (any symptoms 71%; severe 10%), asthenia (any 47%; severe 8%), myalgia/arthralgia (any 44%; severe 8%), anemia (all 33%; severe 1%), nausea (any 30%; severe 3%), diarrhea (any 27%; severe <1%) infections (24%), vomiting (any 18%; severe 4%), and mucositis (any 7%; severe <1%). Other adverse reactions have included ocular/visual disturbances (any 13%; severe 1%), renal dysfunction (any 11%; severe 1%), fluid retention (any 10%; severe 0%), hepatic dysfunction (elevations in bilirubin 7%, alkaline phosphatase 36%, AST [SGOT] 39%), hypersensitivity reactions (any 4%; severe 0%), cardiovascular reactions (severe 3%), thrombocytopenia (any 2%; severe <1%), and injection site reactions (<1%). In clinical trials and during postmarketing surveillance, dehydration was common and pyrexia was very common. Rare occurrences of severe hypersensitivity reactions have also been reported during postmarketing surveillance. Please see full Prescribing Information, including Boxed WARNINGS, CONTRAINDICATIONS, WARNINGS AND PRECAUTIONS, and ADVERSE REACTIONS. Abraxane for Injectable Suspension (paclitaxel protein-bound particles for injectable suspension) should be administered under the supervision of a physician experienced in the use of cancer chemotherapeutic agents. Appropriate management of complications is possible only when adequate diagnostic and treatment facilities are readily available. Abraxane therapy should not be administered to patients with metastatic breast cancer who have baseline neutrophil counts of less than 1,500 cells/mm3. In order to monitor the occurrence of bone marrow suppression, primarily neutropenia, which may be severe and result in infection, it is recommended that frequent peripheral blood cell counts be performed on all patients receiving Abraxane. The use of Abraxane has not been studied in patients with renal dysfunction. In the randomized controlled trial, patients were excluded for baseline serum bilirubin >1.5 mg/dL or baseline serum creatinine >2 mg/dL. Pregnancy-Teratogenic Effects: Pregnancy Category D Abraxane can cause fetal harm when administered to a pregnant woman. If this drug is used during pregnancy, or if the patient becomes pregnant while receiving this drug, the patient should be apprised of the potential hazard to the fetus. Women of childbearing potential should be advised to avoid becoming pregnant while receiving treatment with Abraxane. Men should be advised to not father a child while receiving treatment with Abraxane. Abraxane contains albumin (human), a derivative of human blood. No drug interaction studies have been conducted with Abraxane. Caution should be exercised when administering Abraxane concomitantly with medicines known to inhibit or induce either CYP2C8 or CYP3A4. Abraxane therapy should not be administered to patients with baseline neutrophil counts of less than 1,500 cells/mm3. It is recommended that frequent peripheral blood cell counts be performed on all patients receiving Abraxane. Patients should not be retreated with subsequent cycles of Abraxane until neutrophils recover to a level >1,500 cells/mm3 and platelets recover to >100,000 cells/mm3. In the case of severe neutropenia (<500 cells/mm3 for 7 days or more), during a course of Abraxane therapy, a dose reduction for subsequent courses of therapy is recommended. Sensory neuropathy occurs frequently with Abraxane. The occurrence of grade 1 or 2 sensory neuropathy does not generally require dose modification. If grade 3 sensory neuropathy develops, treatment should be withheld until resolution to grade 1 or 2 followed by a dose reduction for all subsequent courses of Abraxane. Because the exposure and toxicity of paclitaxel can be increased with hepatic impairment, administration of Abraxane in patients with hepatic impairment should be performed with caution. The starting dose should be reduced for patients with moderate and severe hepatic impairment. Injection site reactions occur infrequently with Abraxane and were mild in the randomized clinical trial. Given the possibility of extravasation, it is advisable to closely monitor the infusion site for possible infiltration during drug administration. It is not known whether paclitaxel is excreted in human milk. Because many drugs are excreted in human milk and because of the potential for serious adverse reactions in nursing infants, it is recommended that nursing be discontinued when receiving Abraxane therapy. Adverse events such as fatigue, lethargy, and malaise may affect the ability to drive and use machines.